We’re grateful to Jeremy Paz, John Brent’s son, who lent us a number of audiotapes that feature interviews with several Committee members, many of whom are no longer with us. We thought this one might be a nice tease. 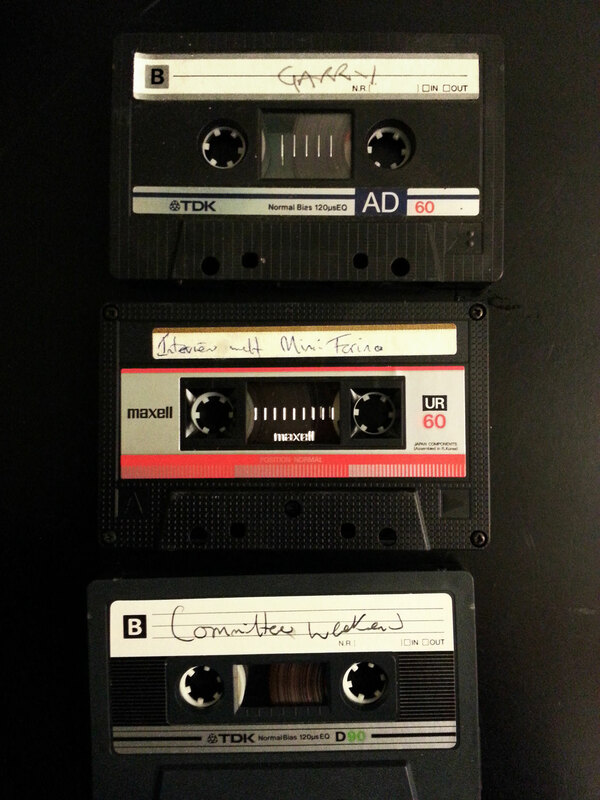 The labels are a little hard to read, but the tapes read, from top to bottom, “Garry”, “Mimi Farina Interview”, and “Committee Weekend”. There are several more. Thanks, Jeremy, for entrusting these valuables with us. They are being stored under armed guard in a climate-controlled former salt mine near Area 51. Garry Goodrow, Mimi Farina, The Committee permalink. ← Get It While It’s Hot. Love Jeremy and loved John Brent. Great place for the tapes to end up. We scattered John’s ashes at Point Doom. Thanks! Point Doom?? Would love to hear more! very interested to hear these!